Kate Middleton and Meghan Markle's seemingly made-up feud is no longer news. Instead, the tabloids are churning out a different drama about the Duchess of Cambridge. Apparently, Middleton has had a falling-out with her former best friend, Rose Hanbury, who has been a prominent member of the “Turnip toffs,” the name of Middleton and Prince William's elite friend group in Norfolk, England. After The Sun ran a report that said Middleton was waiting for Hanbury to be "phased out" of their inner circle and she now sees her ex-friend as her "rural rival," speculation over their alleged falling-out has started to pile up. Within that, it's been suggested that Prince William was trying to repair his wife and Hanbury's relationship. There was also a report by the Daily Mail alleging that both Middleton and Hanbury “have considered legal action” over the published rumors, but didn't because none of the speculation has included the reason for their apparent friend breakup. That is where things get even murkier. Honestly, take all of this with a grain of salt, because, by now, we should all know better than to buy into royal rumors. (The worst of which was Middleton and Markle being pitted against each other, which Buckingham Palace has repeatedly denied.) Still, that hasn't stopped some from giving their own reasons why Middleton and Hanbury are no longer friends. For British writer Giles Coren, the source of their alleged feud may be an affair. 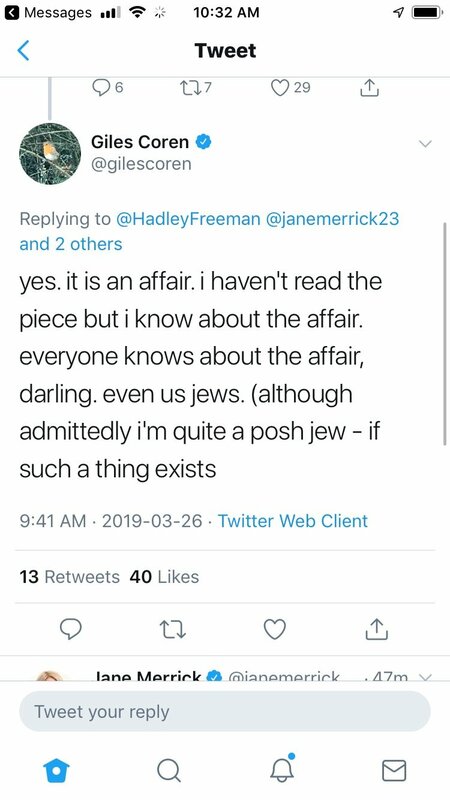 The writer, who has a reputation of being a provocateur at the very least), claimed to know that the reason is "an affair." "I know about the affair," he tweeted (before ultimately deleting it), "Everyone knows about the affair, darling." What we do know about Hanbury is that she has a history with royals. She became the Marchioness of Cholmondeley after marrying David Rocksavage, the seventh Marquess of Cholmondeley and a descendent of the first prime minister of Britain, Sir Robert Walpole. The couple currently lives in Walpole's former home, Houghton Hall, a stone's throw away from Middleton and Prince William's Anmer Hall home. Together, they have three kids: Alexander (the Earl of Rocksavage), Oliver (Lord Cholmondeley), and Lady Iris. Hanbury's royal lineage also dates back to her grandmother, Lady Elizabeth Longman, who served as a bridesmaid for Queen Elizabeth II's wedding to Prince Philip in 1947. Outside of her royal circle, Hanbury has worked in the real world. She was once signed to Kate Moss's previous modeling agency, Storm. She has also dabbled in politics, as a researcher for The Shadow Secretary of State for Education, Michael Gove. Like the royal fab four, she does not appear to have her own social media presence—so don't expect her to address any of these rumors on her own.